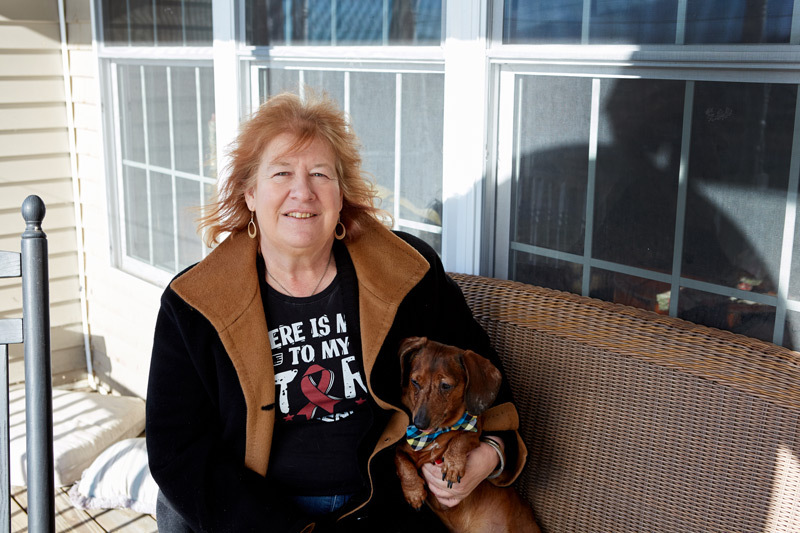 Shortly after the loss of her husband, New Paltz resident Denise Lippolis faced an unlikely and life-threatening battle of her own. Her husband of 18 years, Bryan, 60, had passed away on February 23, 2018 after a three-year battle with bronchial cancer. Beyond mourning her husband, she also began feeling physically ill. At his wake, “I just felt horrible,” recalls Lippolis, who runs a New Paltz title-search company. “I was shaky, and I had a fever and chills.” Lippolis thought she might have the flu. “Everyone thought I was run down from months of taking care of Bryan, but it was different than that,” she recalls. Lippolis, then 60, pushed herself through the funeral service and the reception that followed, before going to bed for several days. A friend brought her to the emergency room of a local hospital, and she was sent home with a diagnosis of the flu. After a few more weeks, mostly at home in bed, her brother insisted she return to the emergency room. A few tests later, Lippolis was sent home again, with a fever of 103. Her diagnosis this time was grief over the loss of her husband. Finally, her brother called a local crisis center in New Paltz for help. They in turn had her taken by ambulance to HealthAlliance Hospital: Broadway Campus, a member of the Westchester Medical Center Health Network (WMCHealth), in Kingston. There, she saw Marc Tack, DO, Chairman of the hospital’s Infectious Diseases Department. Dr. Tack recalls that Lippolis “couldn’t answer simple questions and was in a state of confusion and disorientation.” A spinal tap revealed that she had viral meningitis, which affects the brain, spine and nervous system. This type of viral meningitis, however, was treatable with antiviral medication. During her treatment, Lippolis was supported medically and treated symptomatically as the virus caused her to be in a semi-catatonic state for about three weeks. 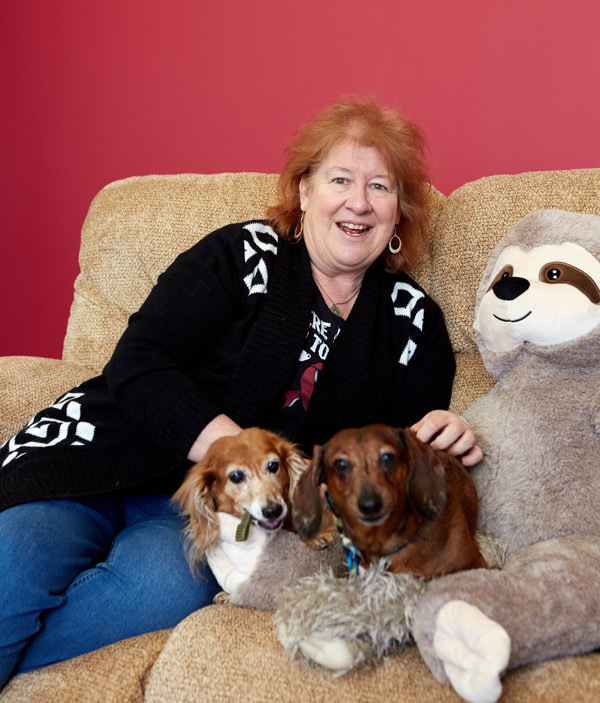 Lippolis is thankful for her two dachshunds, Stan the Man and Audi, who kept her spirits high during the entire healing process. Marc Tack, DO, Chairman of the Infectious Diseases Department at HealthAlliance Hospital: Broadway Campus, answers our questions on meningitis. It’s an infection involving the lining of the brain. The meninges, or tissue that lines the brain, becomes inflamed. There are different causes; however, one type can be spread by close contact with an infected individual. Headache, fever, stiff neck, confusion, delirium, coma and in some cases, death. Usually by taking a medical history, reviewing the symptoms and a physical exam. The diagnosis is confirmed by a lumbar puncture, or spinal tap, in which spinal fluid is removed and tested. While both can be fatal, bacterial meningitis is much more likely to kill you and kill you fast. It’s the ultimate medical emergency in which you have minutes or an hour to treat it. Viral tends to progress more slowly. What do you wish everyone knew about meningitis? To take it seriously. If you have any of the above symptoms, don’t fool around — immediately seek medical attention. Also know that vaccines have completely changed the face of the disease. In the last 20 years, we have seen the incidence dramatically decrease because of these immunizations. Ask your physician about vaccines, and make sure your children’s immunizations are up to date.